Tall, lanky John Anderson was born on a farm October 20, 1922, near Clayton, Illinois, but grew up in the larger nearby city of Quincy. Observing traveling medicine shows as a child on the farm, John became interested in acting, becoming involved in high school plays. Following high school, John moved to St. Louis, Missouri, where he worked as a radio announcer. He soon was working as an actor on a Mississippi showboat, The Goldenrod, in what he termed “corny melodramas,” for about six months in 1942. After Coast Guard service during WWII, John returned to Quincy where he worked in radio, married, and took advantage of the G. I. Bill to study drama at the University of Iowa. During his last year he got a job in summer stock in Buffalo, New York. When the summer stock season closed, John joined the Cleveland Playhouse, one of only two resident companies in the country, the other being the Pasadena Playhouse. After one season, John decided to try his luck in New York in 1950 where he worked for six years in off Broadway shows, winter stock and live TV, finally landing a Broadway show, “Cat On a Hot Tin Roof” in ‘56. The show then toured the country, including five weeks in L.A. 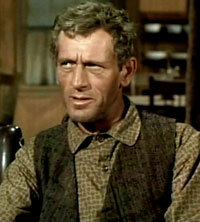 Picking up an agent, he was cast in a lead guest star role on an episode of “Gunsmoke”. John remembered, “It’s like an actor’s dream. The show was a big hit and the role I was playing was a very showy villain with heavy make-up, just a crazy man (“Buffalo Man”). It really opened doors, I just ran from one show to another. 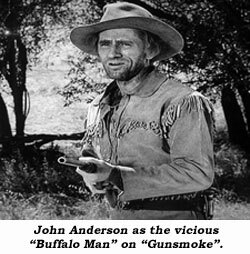 I did the craziest, nuttiest guys in the world and I had a ball doing it.” Anderson returned to appear on 10 other “Gunsmoke” episodes. In the ‘50s John segued from “Gunsmoke” to “Trackdown”, “Have Gun Will Travel”, “Tales of Wells Fargo”, “Rifleman”, “Bonanza”, “Wanted Dead Or Alive”, “Johnny Ringo”, “Big Valley”, “Laramie”, “Maverick”, “Virginian”, to all of the other TV westerns of the period. In all, John worked on over 500 TV shows. 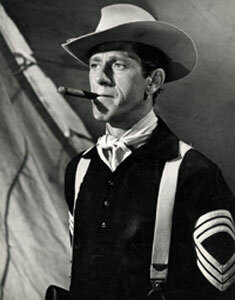 From ‘58-‘61 John played the recurring role of brother Virgil Earp on Hugh O’Brian’s “Life and Legend of Wyatt Earp”. 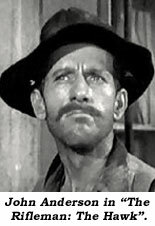 By 1960, John began to obtain roles in major films such as Alfred Hitchcock’s “Psycho” and Sam Peckinpah’s “Ride the High Country”.